Directions to Water Valley: From Cochrane, go north on Highway #22 for 35 km (or from the junction of Highway 27 & 22, go south 32 km), turn and go west on Highway #579 for 8 km. You will come to a 4-way stop in Water Valley, keep going west through the 4-way stop and the community hall will be on your left (across the street from the hardware store). Canine or Feline: can you tell the difference? This article originally ran in the Summer 2005 issue of the James River News, a newsletter produced by the JRR Condo Association from 2005-2009. The James River Retreat is home to a wonderful variety of wildlife, human and otherwise. Sightings over the years include black bears, beavers, coyotes, red foxes, deer, moose, elk, wolves and even a domestic black cat that, from a distance, had us stumped for a time. Not all animals at James River like to be seen and the fresh mud along the river bank is a great place to look for signs of our more furtive neighbours. We recently came across the track pictured below a short distance upriver from the bridge. We immediately set about trying to figure out what animal left it behind. It’s trickier than you might think. 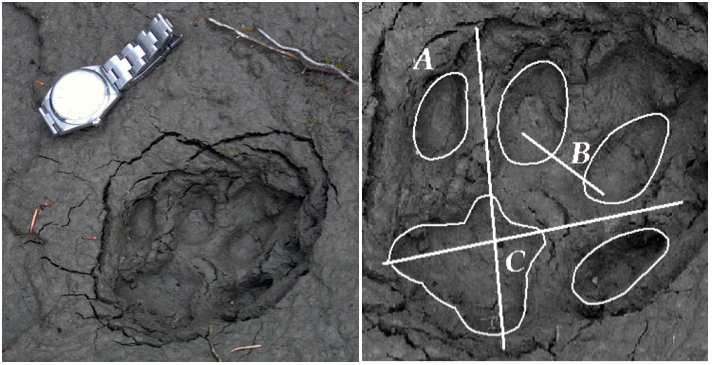 The size of the track – slightly less than 10cm long – seemed right for a large dog, large coyote or small wolf. But members of the dog family usually leave claw marks, especially in soft mud like this. Members of the cat family have retractable claws that rarely register in the tracks they leave behind. Could this track have been left by a cougar, lynx or bobcat? Imaginary lines drawn along the ridges between the two pairs of outside toes intersect in the middle of the heel pad rather than at the top of it. Looks like we may have a new neighbour, folks. Check out the tracking website some time and see if you agree. 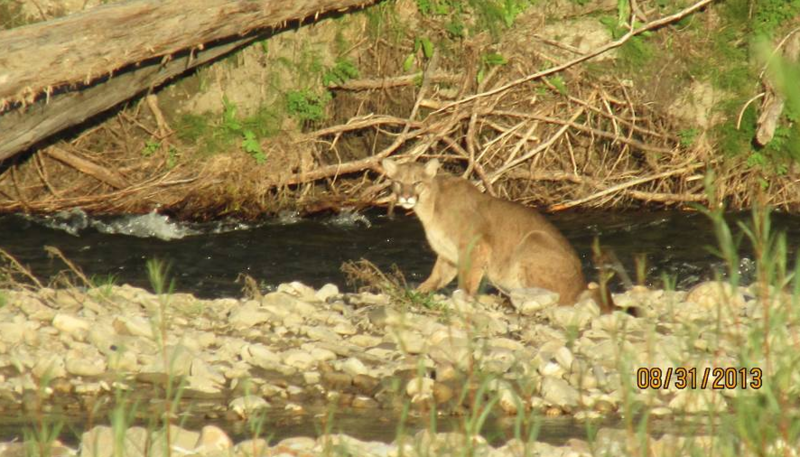 Maybe one day if we’re lucky, we’ll be able to add “cougar” to our list of animal sightings. From a safe distance, of course! There have been multiple cougar sightings nearby and inside the Retreat since this article first appeared, including the one pictured below. The youngster was photographed by Liz and Bob Moore on the riverbank below their place last summer. For more information on safe recreation in cougar country and signs that a cougar is in the area, visit Alberta Environment and Sustainable Resource Development’s webpage Recreation in Cougar Country or download Alberta Park’s Preventing Conflict with Wildlife: Cougars.